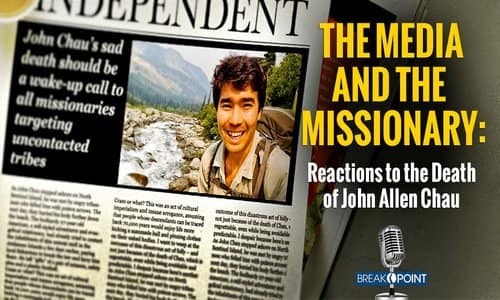 By now, you've undoubtedly heard about the death of John Allen Chau, the 27-year-old missionary who was killed by the natives of North Sentinel Island. And you've heard a lot of opining about his death, too. North Sentinel Island is home to one of the last uncontacted people on earth. The Sentinelese, as they're called by outsiders, reject, often violently, any attempts at outside contact. In the thirteenth century Marco Polo described them as a "most violent and cruel generation who seem to eat everybody they catch." Chau's death drew immediate comparisons to the story of Jim Elliot, one of the five American missionaries killed by Auca natives of the Amazonian Ecuador in 1952. His story was told in the 1957 classic "Through Gates of Splendor," by his wife Elisabeth. The book has inspired countless numbers of Christians, including me. Even before that book was published, many Americans knew the story from a 1956, ten-page article in Life magazine entitled "Go Ye And Preach the Gospel." The title wasn't ironic. It was a respectful, even admiring, account of their sacrifice and their widows' efforts to complete the work they gave their lives for. Here's an actual quote from the Life article, "The wives carry on, trusting that the Aucas will still be saved." Legitimate questions remain about the prudence of Chau's actions. Much was made about the risk of spreading infections to the Sentinelese for which they have no immunity, though my friend and colleague Ed Stetzer has helpfully corrected the gut-level, and ultimately wrong, accusation that Chau was an unprepared, vigilante lone-ranger. Still this whole cultural episode speaks volumes. For example, Janet Street-Porter, a columnist at the UK's Independent newspaper, called Chau's efforts "an act of cultural imperialism and insane arrogance." His story, she says, is "another example of two of the worse kinds of environmental pollution: aggressive pushing of faith to another culture and the introduction of 'gifts' which undermine their way of life." She continues, "John Chau claimed he wanted to introduce Christ to the Sentinelese - but why would their own culture not include a deity, a belief in the afterlife or some sense of fulfilling spirituality? Why would his evangelical creed be superior or necessary?" She calls this belief "hard to stomach." You can quickly sniff out the embedded secular assumptions in her question, but harder to stomach is how people like Street-Porter don't advocate a similar hands-off approach to other cultures when it comes to causes they care about. We've yet to hear a secularist outcry over the American government's efforts, especially under the last administration, to use international aid as a cover for colonizing developing nations in abortion rights and LGBT ideologies. No, Secretary of State Clinton was lauded for making gay rights a priority, and it didn't matter what long-established beliefs a culture held. You'll never hear them applaud people like African Christian pro-life activist Uju Ekeocha who oppose Western "colonialist" efforts to inflict abortion on traditional African cultures. One wonders if Chau would still be a modern-day villain had he been trying to talk the Sentinelese out of homophobia. No, our culture's problem with Chau wasn't that he was a missionary seeking to convert the Sentinelese -- it was that he represented the wrong belief system.